There’s an argument now percolating in comic collectors circles that a comparable TEC 27 would now fetch more than Action #1. It’s not been tested yet. I disagree with Gene on one point. I think Hulk 181 Cover is more likely not to break out of the narrow hobby confines than Action 1 Cover. If Action 1 Cover were “discovered” tomorrow it would be a pretty big media deal. Just the record sale of Action 1 got a ton of media coverage. And whenever someone finds an Action 1 or TEC 27 it gets a bit of media coverage. Action #1 would transcend the hobby. Hulk 181 won’t. Well, the interiors we know were all preserved, complete, in the Marvel warehouse for various reasons, including future reproduction efforts. The covers were not. It's uncertain whether most of the covers exist or not; many believe that they were destroyed at the printer and/or otherwise not saved. I'm no expert on this, but, I think most people in the know lean towards the covers not existing anymore. Cap #1 cover was rumored to be owned by an old-time dealer. I know some current dealers have been to his house, trying to see what he has...I guess you have to be in the deep reaches of The Cabal to know whether he ever gave up the goods or not, though. Actually, you'd be disagreeing with others there, not me. I agree that the Hulk #181 cover, which I believe will surface at some point (no, I don't know who has it), won't be a huge deal outside of the hobby outside of the usual puff pieces that show up on the hobby websites, Yahoo! News and wherever else the PR people for the auction houses manage to land them. Maybe they will have the courtesy to start the articles off with "SNIKT!" instead of the usual "BAM! POW! ZAP!" bog-standard superhero sound effects. The Action #1 cover, if it surfaced, would get more play in the media, sure, but, I don't think it would translate into serious outsider bidding interest for it. Cool stuff pops up all the time in what passes for news these days; it goes in one ear and out the other. The Action #1 would only be a big, notable, memorable deal for people with a pre-existing connection to it. For everyone else, at best it's "oh, that's cool", and then it's back to regular life. 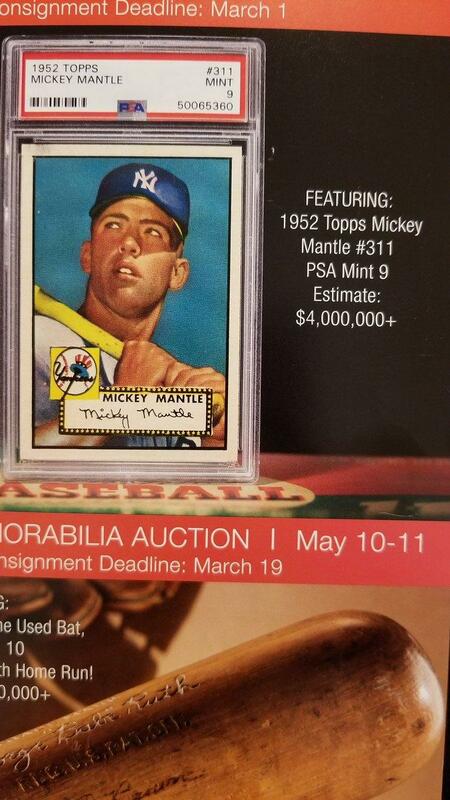 A high grade Mantle Rookie card just sold for $2.8 Million at auction. This despite the baseball card market cratering. Bodes well, possibly, for the transcendent pieces in our hobby, I think. And I have a hunch many of the Marvel Silver Age covers are out there somewhere. 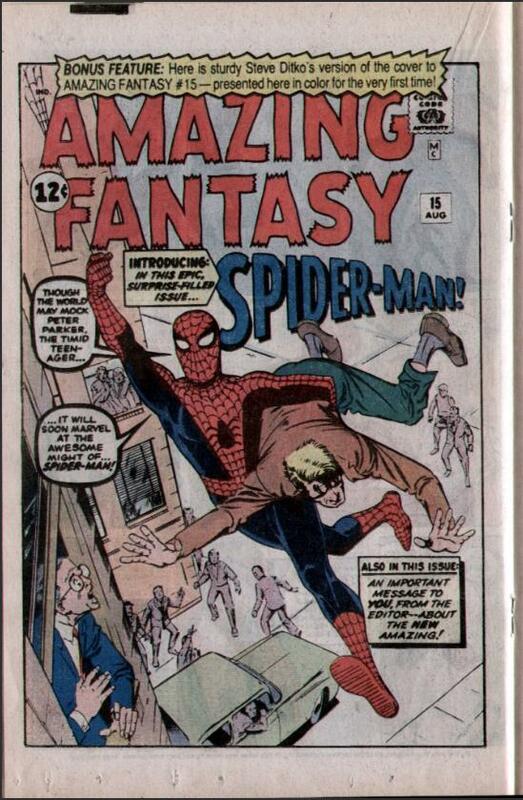 We know that Ditko’s Original unused AF 15 Cover survived. So why wouldn’t the actual published cover? Why would Marvel tell the printers to return the interiors but not the covers? We know artists were already saving key covers from the Golden Age, so why would no one have an interest in saving these as well? We know artists were already saving key covers from the Golden Age, so why would no one have an interest in saving these as well? Golden Age "saving" was so scattershot, and the why is too long to go into here, it's not worth mentioning. There was no concerted effort to that end except for the Harvey warehouse hoard and Bill Gaines keeping all the EC art back. Both of those were anomalous accidental genius moves because dispersion returns would have resulted in mass destruction not preservation. '52 Topps Mantle PSA 8s are up 8-fold since 2011. PSA 9s 10-fold since 2008 (of which there are SIX, plus, three PSA 10s). It is absurdity beyond absurdity. The market for that card was range-bound for TEN YEARS before it started ramping exponentially higher from 2012. I was told recently by a sports card dealer that there has been a Wall Street cabal buying the cards up. Let's see what happens when they sell. I think that card loses value across the board adjusted for inflation 20-30 years from now. Incidentally, even though it fetched $2.88 million, the estimate was $3.5 million-plus. And, in the earliest flyers they sent out (see photo attached), they were estimating $4 million-plus. WHO SAYS THEY DON'T RING A BELL AT THE TOP??? From the breathless hyperbole about the card and the can't-lose nature of it, down to accepting cryptocurrencies as payment. This is Peak Everything summed up in a nutshell. Did the Ditko unused AF 15 cover survive? Regardless, if it survived, it's because it never went to the printer and remained in Ditko's possession (or Severin's), presumably. I think people have said that the covers were not considered needed for future reproduction, only the interiors, and so were ordered destroyed after printing, at least in the early years. I guess some covers were saved at the printers and such, but, the presumption is that most of them were discarded. I don't have any special insight myself, but, that is the consideration of the most knowledgeable collectors in the hobby that I know. The unused Ditko cover to AF #15 was used as a variant cover for ASM #700. And Sean Howe posted a photo of the OA online. Now...the question is...what would THIS sell for? "Along with standard payment methods, we will be accepting cryptocurrency for this lot at the request of our consignor. The following cryptocurrencies will be accepted at their spot value at the time of payment: BTC, ETH, XRP, BCH, LTC, NEO, DASH, IOTA,& EOS. Others may be accepted if arranged before the closing date." Yes. But we know that people like Jerry Robinson and Joe Simon were saving some of them already. I just have a suspicion that they are out there still. OA, or is it a stat? If the OA exists, where is it? The price-tag and Comics Code stamp would have been stats pasted to the OA, with maybe some touches of white-out for corrections, and I don't detect any signs of that on this image. Yeah, this piece was first published in the interior of the marvel tales issue that reprinted AF15 in the 80s. I suspect the image is a doctored version of that printed image. You're talking about grains of sand...I'm talking about the rest of the beach. Silly. None of this has anything to do with early Marvel superhero covers though. Joe Simon and Jerry Robinson weren't at Marvel 1961-1964! And Jack...we'll he was way too busy drawing complete books every three days to be worried about 'saving' covers. That's the past time of editors and other bored bullpenners. And 61-64...well that was really just Stan wasn't it? So either Stan's estate will eventually puke up everything or we'll then known with certainty, it's all lost forever. ....and then somebody did just the blacklines... the trimming of which, for the word bubbles on the left, now matches the "Sean Howe" copy. So "Sean Howe" probably took this image and photoshopped it onto an old board. Hmmm. Not good then for those hoping the original still exists. It may but the b/w image does not add to the argument.